Looking for a way to make your simple, wedding gown pop? What if you added a beautiful, bib necklace to top of your day of ensemble? Take a peek at these real-life options and see if they make you swoon a bit! A bit of Victorian accent make this dress transform into something even more magical. Every bride deserves a bit of bling, no matter the time or season. Add “something blue” to your creamy outfit and make your eyes pop. We are loving art deco-inspired jewelry right now and this piece is a stunner. Keep the color subdued but the style high with these beautiful number. Jump outside the usual tradition and use gold as the main course for your jewelry selection. Incorporate the bridesmaids colors by adding a surprise to your bridal style. 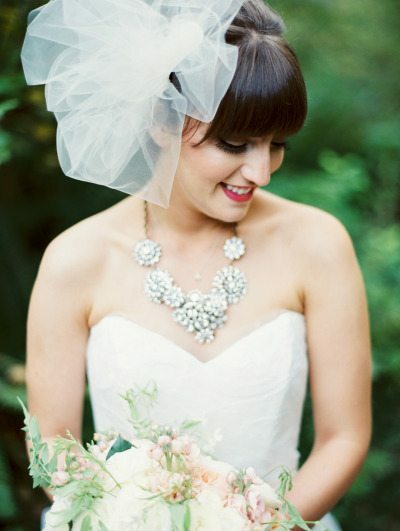 A classic bib necklace is perfect for a classic, contemporary bride. Really set the tone of your fun and vibrant day by adding a bib necklace that speaks leaps and bounds of your personality. For ultra glam and to feel like a blushing bridal princess, go for the sparkles.